In a season that marks Philadelphia's return to basketball relevance, it only seems right that they would have to face their hated rivals to the north in order to make noise in the playoffs. 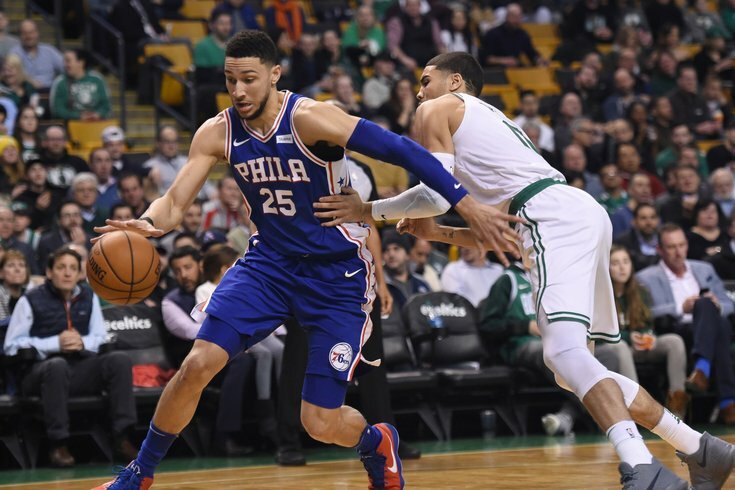 After a brutal five-game slugfest against the Miami Heat, the Sixers are now tasked with battling the Boston Celtics, in many ways a better version of the team Miami tries to be. If you were building predictions just based on regular season results, they would not smile kindly on Philadelphia's fortunes in this series. The Sixers went 1-3 against Boston in the regular season, which included a total collapse in their game on neutral soil in London, and would have been a series sweep for the Celtics if not for a heroic Joel Embiid performance in the final meeting of the year. But a lot has changed since these teams last met. The last meeting between the two teams came on January 18, and a Sixers victory got them over the .500 mark at 21-20. The Sixers would end up going 31-10 the rest of the way, thanks in part to a new-look second unit and the coalescence of the team around Joel Embiid and Ben Simmons. So the results we saw between the Sixers and Celtics are more difficult to read into than the season series against Miami, as both teams have evolved a ton since their battles in October and November. The experience of a long season has hardened the likes of Simmons, Embiid, Jayson Tatum and Jaylen Brown, who will all expect to be key figures in the battle for a spot in the Eastern Conference Finals. There's still plenty to take from those games, each team's respective performance in the playoffs so far, and their overall bodies of work, however. Let's walk through some of the key matchups, statistics, and players before we formulate a prediction on the outcome. It's hard to overstate just how different the Sixers and Celtics are since they last played on January 18, let alone compared to the teams who did battle in the early season. Jerryd Bayless was a starter in their October meeting, and a critical member of the rotation in all four meetings in the regular season. Anecdotes like this, in addition to Kyrie Irving's absence from this playoff clash, highlight the evolution of both clubs. Boston clearly had the upper hand in the season series this year, but these changes mean it's not as simple as pointing to how the regular-season series unfolded and expecting results to hold in the playoffs. The Sixers acknowledge how things have changed and insist the main takeaways are general concepts rather than nitty-gritty details. "I definitely think even just from watching clips, you can see we play differently, they play differently," JJ Redick said after emerging from a film session. "What you can take from those four games is just general coverages, maybe how they're going to guard Jo, how they're going to guard off-ball screening, how they're going to guard Ben...you can take all that stuff, but we obviously play differently and they do as well." "You can take enough. You certainly can't take it all, and to a level you wish you could," added Brett Brown. "You can like, mirror up things you think maybe in smaller doses you saw in those games, and pair it up to what you're seeing [Boston do] against Milwaukee, or what you saw that they did late in the season, and try as best you can to connect the dots. You can get enough, you certainly can't get it all." With that in mind, the total bodies of work for both teams are a little more useful to evaluate. The Sixers and Celtics profile as remarkably similar teams on the defensive end of the floor. They were elite at protecting the three-point line all season, and both boast switchable athletes on the wings and an impactful big man at the heart of their defense. Joel Embiid and Al Horford get their work done in vastly different ways, but both were critical to the defensive style their squads played all season. One primary point of distinction is the level to which each guy shuts things down at the rim. Horford's value on defense is primarily in his versatility and ability to negate mismatches on switches, as he does not have the raw size to be a rim defender on the level of someone like Embiid. That doesn't mean you can't feel the difference — Philadelphia shot five percent worse from five feet and in against Boston than they did over the course of the entire regular season, and the Celtics — who were already fairly poor around the basket this season — saw their effectiveness drop by another two percent against the Sixers. Because of the respective playstyles of the teams, Embiid can theoretically tilt the series on defense more than Horford can. Boston is one of the most isolation heavy teams in the league, having used 8.3 percent (good for 7th in the league) of their regular season possessions on iso opportunities. Even without Irving, that number has gone up for the Celtics in the playoffs, representing over 10 percent of their playoff possessions. This is on some level a function of the personnel. Irving is and was one of the most gifted iso scorers in the league, and Tatum is one of the more polished wing scorers we've seen emerge from the college ranks in years. Still, it is asking a lot of players to create good offense out of these plays on a routine basis, especially in the case of a young, developing guy like Tatum. You take the threat seriously if you're the Sixers while understanding the numbers tilt in your favor when you ask guys to score this way repeatedly. It would be unfair to boil Boston's offense down to this, because Stevens is one of the more inventive coaches in the league after timeouts. But the important thing to keep in mind for Boston is how dependent they were on Kyrie Irving to create offense in the halfcourt, which is a problem that simply isn't going away. In the stretch following Irving's last game on March 11, the Celtics posted a 103.3 offensive efficiency in their final 15 games, a mark that would have placed them 24th in the league over the course of a full season. They bounced back against a poorly-coached Bucks team in round one, but that stretch highlights their limitations when they don't have a singular offensive talent to play through. Their path to winning is to beat you with defense, because asking two young and relatively raw wings to be your offensive creators is a tall task. Philadelphia's primary advantage (beyond top-end talent) is their ability to play and thrive in different sorts of games. While they play an up-tempo style, they have the luxury of switching back and forth between playing through Embiid in the post and getting out on the break with Simmons leading the pack. Both are dangerous options, and while Boston has the young legs to lean into that tempo a bit more, they have ultimately chosen not to. In fact, the two teams have leaned into their identities further in the playoffs. Philadelphia has played at the fastest pace in the league during the playoffs, while Boston has trended in the opposite direction by cutting down their pace by about four possessions per game. The latter is a reflection of how the playoffs trend historically, so the fight to establish the dominant style will be an interesting chess match between Stevens and Brown. The Celtics do not want to get into a run-and-gun game with the Sixers, and some of Milwaukee's best stretches in round one came when they forced Boston to keep up with them in transition. Expect things to swing wildly between run-and-gun and Rip Van Winkle from game to game, or even quarter to quarter. Before we get into the how and why of why this is the case, we can acknowledge one simple reality — Joel Embiid has not played all that well against the Celtics this season. Granted, he has only played three games against them, but Embiid managed to shoot just 38.5 percent from the field, including just 8.3 percent of his attempts from beyond the arc. That is not a misprint. They keep him honest. They double from different spots, they leave Ben or T.J., have random doubles. Aron Baynes I know well, I coached Aron for many years, and he's a physical defensive player, he does a good job. Sometimes Al will end up on Joel and just be like a smart veteran and get underneath him. He plays about six inches lower and can move his feet. Schematically, defensively they're solid, Brad does a great job. I think the individual pieces that they have defensively are elite, you start looking at their bodies 1-7 they really individually can guard their own man. All of that equaled pretty good defense on Joel Embiid. There is something to be said for Boston's defense on Embiid, which will not be a big departure from what he faced against the Miami Heat. They will crowd him, swarm him, and make a concerted effort to prevent him from getting comfortable. But frankly, the Celtics are not that well-equipped to handle him when he gets the ball on the block — at least to the extent that he would be a 38-percent shooter — and the Sixers should do everything possible to establish him there early. In his best game of the year against the Celtics — a 26-point, 16-rebound, six-assist effort on January 18 — Embiid brutalized the Celtics without paying almost any attention to the perimeter. The big man took just one three on the night (which he promptly missed), instead focusing his energy on serving as their offensive hub on the block. His most impressive work was not done because he was the biggest man on the floor, but because the Sixers used the attention placed on stopping him and thrived around him. Brown is right about the help defense coming from all angles, so the key is for Embiid to keep his head up and for the guys around him to move with purpose. The Sixers did an excellent job of cutting off his post-ups in the final meeting in Boston this season, and Embiid did a great job of searching for the openings created by help defense, even when guys missed shots. The Sixers have enough offensive depth that they don't need Embiid to just drag them to victory as a scorer. There will be a game or two when the shooters go cold and Embiid's ability to will himself to free throws will be critical, but this is what they look like when they're at their best. Embiid is going to have to spend time on the perimeter because he's too valuable as a screen-setter on curls and is much better as a shooter than he looked against the Celtics this year. It is never going to be the focal point of his game, but it's a weapon in the arsenal that needs to be used in order to save some pounding on Embiid's body and open up the floor for Simmons. How much is too much on either side of the equation? That's up to Philadelphia's coaching staff to figure out. One of the only players who managed to exceed (or at least meet) expectations during Philadelphia's regular-season matchups with Boston was their hired gun. JJ Redick led the Sixers in scoring against the Celtics this season, absolutely burning down the nets from beyond the arc. On over seven attempts from three per game, Redick shot a remarkable 59 percent from three against the Celtics this season. This is (quite obviously) not something you'd expect him to repeat against the league's best three-point defense, though getting Redick and Belinelli going will be a big key to the series. Going back through the footage, what should be encouraging from Philadelphia's perspective is Redick's success getting open regardless of who Boston was throwing at him as a defensive matchup. Brown's comment about having athletes 1-7 is true, and it lets Stevens throw different-sized bodies at different matchups when the mood suits. The Sixers have done an excellent job, however, at brushing off Redick's defenders with multiple screens and constant movement. That's been a theme regardless of opponent, but the Sixers have done well freeing Redick even when he's being chased by a bigger, more athletic defender like Brown. These plays aren't always going to work, and Boston's players are dialed in (and athletic enough) to recover on shooters who have separation created for them. They aren't the best three-point defense in the league by accident — their defenders are good at identifying when to help, how to help, and in doing so without fouling. You can only run so many curls for Redick before Boston snuffs out the play, so the Sixers will need to use counters to get him shots out of different looks. Luckily, they've already done this to an extent in the regular season. Those are the sort of plays the Sixers will have to use for both Redick and Belinelli to keep Boston on their toes. The more they can make Celtics players guess running through traffic, the easier it is to free their guys for good looks. The question that has been asked since before the season started remains just as poignant today: how will [Insert Team Here] defend Ben Simmons? Conventional wisdom suggested sagging off a non-shooter would work, but over time that has proven only to give him a runway to build up steam and finish over/around defenders in the paint, or otherwise see the floor a lot easier. Boston's coverage of Simmons in the regular season mirrors some of what we saw from Miami in the previous series. They did not commit fully to any one set of principles, choosing instead to keep him guessing. But there was a clear preference in terms of the sort of players they want taking the assignment: Al Horford and Marcus Morris were the two leading defenders on Simmons in the season series, and Simmons struggled to get absolutely anything going against either guy over the four games. Horford gave Simmons fits in their four matchups, holding him to just 33 percent shooting on possessions where he was the primary defender. The possessions where they were matched up are instructive because they show an assortment of coverages when Simmons has the ball on the perimeter. In the clip below, watch how Horford sinks deep into the paint under screens on one possession and then plays what we can say is something like 3/4 coverage on another. The second one there is key because it shows why Horford is such a problem for Simmons. Without the jumper, Horford doesn't have to respect him enough to get into his chest at the three-point line, and while he doesn't have the same top-end speed as Simmons he does have the length and positional savvy to neutralize some of Simmons' athletic advantages. Simmons is obviously much more than a scorer (and really isn't a scorer at all yet), but the Sixers can't lose this matchup to the degree they did in the regular season and hope to win the series. There are signs of hope for Philly within the tape, where Simmons uses his strength to create separation and a good attempt for himself at the basket. His touch failed him more often than it should have, and it's a near certainty that he'll finish at a higher rate than he did against Boston in the regular season, particularly with the new and improved bench. This is where the lineups featuring Ersan Ilyasova at the five will be key to Philadelphia's success. Without Daniel Theis available, the Celtics no longer have a surplus of guys who can protect the rim and guard out to the perimeter. Baynes does his job as an interior guy well, but you don't want to ask him to guard 20+ feet from the basket. If the Celtics have to counter that with Horford playing more minutes at the five, there's a good chance Simmons has one of the wings slide onto him, and he's had more success attacking those matchups. Simmons has only improved in the time since he last went up against Boston's defense, so even if coverage and matchups stay the same there's reason to believe his numbers will be much better. But the Sixers should take nothing for granted against a defense of Boston's caliber. This may be an unpopular opinion back home, but Philadelphia's hard-fought, fairly comfortable victory against the Miami Heat has been run with a little too much. Yes, the Sixers were absolutely the better team and they come into the matchup with Boston with a talent advantage. That alone, though, is not going to be enough for a victory. Boston is a little more capable of punishing Philadelphia for mistakes than Miami, and they are equipped with a much better big-money big man than Hassan Whiteside. There's not a guy to pick on a la Whiteside who you can target and count on him folding on both ends when things start to run amok. The Celtics are smart and disciplined in a way that masks their youth. Some of that is a credit to Stevens. The Sixers will be able to leverage their talent to go on the scoring outbursts that have become customary in the second half of the year, but Boston's coach is good at minimizing the damage teams do when they're hot. He's better than most coaches at using his timeouts to snuff out momentum before it can really build, which you'd presume will curtail some of the Belinelli scoring barrages that have been all the rage in Philadelphia. There's also the matter of homecourt advantage, which no one should take lightly. The Celtics did not drop a single game at home to the Bucks despite not having their best stuff in round one, and going into TD Garden is a much different task than leaving Miami with a win. It's a fanbase with a sense of big moments and a pride in their teams similar to Philadelphia's. It will be loud and intimidating on the road in round two. All that being said, the Sixers do still have the talent advantage, and they are in much better form than the Celtics have been. Jaylen Brown looks likely to miss Game 1, and if the Sixers can use the opportunity to steal an early game on the road, things will start to turn quickly. The Sixers no doubt have the best player in the series, and depending on how you feel about Horford and Simmons they probably have the second-best player, too. With defenses of a similar caliber, good coaching and great home crowds on both sides, ultimately that's where you have to lean. The Sixers should win, just don't write anyone's epitaph prematurely. Philadelphia was on the other side of the equation as an underdog in February — the Eagles won the Super Bowl, 41-33, over the New England Patriots, in case you forgot — and would be wise not to get ahead of themselves in May, lest they suffer the same fate as Tom Brady.